Mina Han is a young woman who lives in a fantasy world full of orcs, dwarves, and monsters. She also works at her parents’ restaurant, but desires to enlist in the Battle Chef Brigade: an army of chefs who fight monsters and then cook them. So she runs away from home to participate in a big cooking competition so she can join the brigade. In this game you play as Mina in a unique mix of 2-D hack and slash and match three puzzle solving. It’s available for PS4, Switch, and PC, but reviewed on Switch here. Since I didn’t review the original release of the game, I’m also not sure what was added for this Deluxe version. 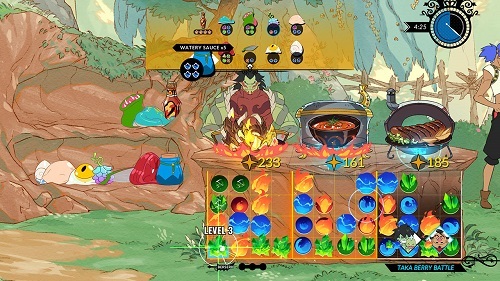 The main mode of the game has two parts. The first is the 2-D hack and slash areas. Here you fight monsters with gameplay that reminds me of titles like Odin Sphere. Once you defeat a monster, they’ll drop an ingredient that you can use to cook with. Once you have enough ingredients, you can run back to the kitchen for the second part of the game: puzzles! In the kitchen, the ingredients are represented by colored gems arranged in different patterns. Drop them into the pot, and ‘stir’ them by rotating them with the right stick. When three match up, they’ll merge into one more powerful gem that’ll earn you more points. Once you’ve matched up all you can, you go back outside to fight more monsters, get more ingredients, and repeat the process. These hack and slash/puzzle challenges are wrapped up in an Iron Chef style competition. You have to make a dish for one or several judges, and are competing with another character. Whoever makes dishes with the highest score wins. Some judges like it if you prepare food using certain colored gems, and just like many Food Network shows, there is always a certain ingredient that you have to work with. Every battle introduces something new, like more challenging monsters to fight, bones that get in the way of puzzles, poison gems, sauces that change the gems’ colors, and much more! You have a time limit to fight monsters and prepare food, and must serve your dishes before the clock runs out to qualify. Whoever has the highest score, wins. All this is wrapped around a story mode where you can walk around a small town between battles. You can talk to other people, and play mini games that can hone your puzzle and hunting skills as well as earn some extra coin. Spend your money at the shop where you buy new fighting skills, pots that give certain gems bonuses when you cook in them, and much more. Once you beat the game, you can even play it again as another character! Aside from the story, you can also try daily competitions and challenges with special rules. Unfortunately, the game has a few problems. There is no way to know what ingredients you’ll need to focus on in the next battle, so it’s nearly impossible to strategize what items you need to bring. It’s all trial and error. And the time limits seems a bit too short. I know they were trying to maintain the frantic feel of the Iron Chef shows, but it gets in the way of the fun. Plus the game gets a bit repetitive, too. It’s a shame because the rest of the experience is top notch, with likable characters, graphics that look like a manga comic book come to life, amazing voice acting, and unique gameplay ideas. It’s worth checking out, but don’t be surprised if you don’t want to come back for seconds. 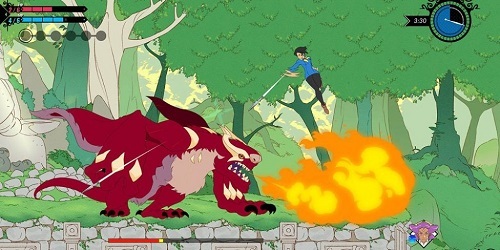 Battle Chef Brigade Deluxe is rated E-10 with ESRB descriptors of Alcohol & Tobacco Reference, and Fantasy Violence. Some of the characters do drink and smoke, and you can hit monsters with weapons and magic, but they just disappear and turn into food ingredients when you defeat them. I’d say the game is best enjoyed by older kids since reading skill is required and there is a bit of a challenge to be had here.